Rob Elam sounds like the Billy Beane of the ethanol retail game. But instead of pioneering analytics in baseball for the “Moneyball” Oakland Athletics, he pores over data to keep giving Propel Fuels customers what they want. And what they want is a good product to put into their flex-fuel vehicles. One that’s better for air quality and the environment than gasoline. And this is the important part: It has to be cheaper. 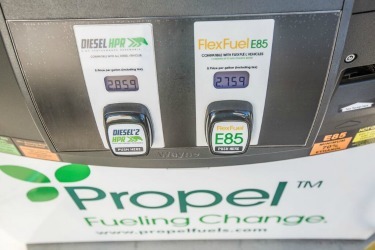 Elam, the founder and CEO of Sacramento-based Propel, says the company is the largest E85 retailer in California, selling about 70 percent of that fuel blend in the state. Propel owns about 50 E85 dispensers that deliver an average of about 25,000 gallons each per month. Elam says the national average is about 4,000 gallons per dispenser per month. Propel analyzes its customer base closely to figure out where flex-fuel vehicle drivers are; where to open new pumps; how to price the product; and what decisions to make as far as wholesale purchasing. Propel buys much of its ethanol from Pacific Ethanol, which has plants in Stockton and Madera, keeping the supply chain local and costs down. Most often Propel will install a new underground storage tank for E85 or renewable diesel, less frequently using an existing, under-utilized tank. The signage, the equipment are all Propel’s, and so is the risk. Elam acknowledges that the climate for selling E85 nationally is difficult, with gasoline prices low. But he sees the tide turning, largely because of the movement to reduce emissions from transportation. Oh, and because of antipathy toward the oil companies. A gallery of Propel customers. Photos courtesy of PropelFuels.com. To any retailers or ethanol suppliers considering offering E85 as part of their fuels program, Elam encourages them to think like a certain ubiquitous chain of coffee shops. “If you look at Starbucks and say, ‘Wow they’re wildly successful,’ they didn’t just take these out-of-the-way, crappy locations that had cheap rent and build one of the most successful consumer brands. They went to the places where they knew their customer demographic was located and built a store that gave an experience their customers wanted to have. “So anybody who’s coming into this business should expect it to be exactly what it is, which is the challenge of introducing a new product. And you cannot come in loaded with assumptions, you need to listen to your audience and understand what the customers want, and give them that. The entrepreneurial Starbucks comparison isn’t accidental: Elam started Propel in his Seattle garage in 2004, installing three biodiesel pumps in the city and expanding from there. Elam is a fifth-generation Californian originally from Davis, but he has a strong connection to the Pacific Northwest, spending time in Seattle and Portland. He and his family love the outdoors, and he devotes much energy to salmon and forest protection. Selling alternative fuels isn’t just business for him.